In the Navajo tradition, kids grow up learning about running as a part of their culture. They run east in the morning to meet the sun, and to meet the Creator. For the Navajo, running isn’t simply a way to stay physically fit, it’s a spiritual practice. Running is a form or prayer. In the film 3100: Run and Become (which was just released last week), Shaun Martin, a Navajo athletics director and elite ultra runner, describes well the importance of this practice. Running is a prayer. We use our feet to pray to Mother Earth. We breathe in father sky. Running is a celebration of life. And running is a teacher. Running helps us get through the hardships, and helps us get through any troubles we might be facing. And ultimately, running makes us the person we want to be. 3100 presents running as a human practice for connection and transformation that’s part of our collective DNA, rather than a ritual claimed by a particular religion. Over the past couple years I’ve come to appreciate running as a form of prayer. Having long grown weary of prayer as simply a multiplication of words and requests, I’ve embraced a daily practice which involves my entire body and lends itself to silent connect and listening, without the need for a lot of words. 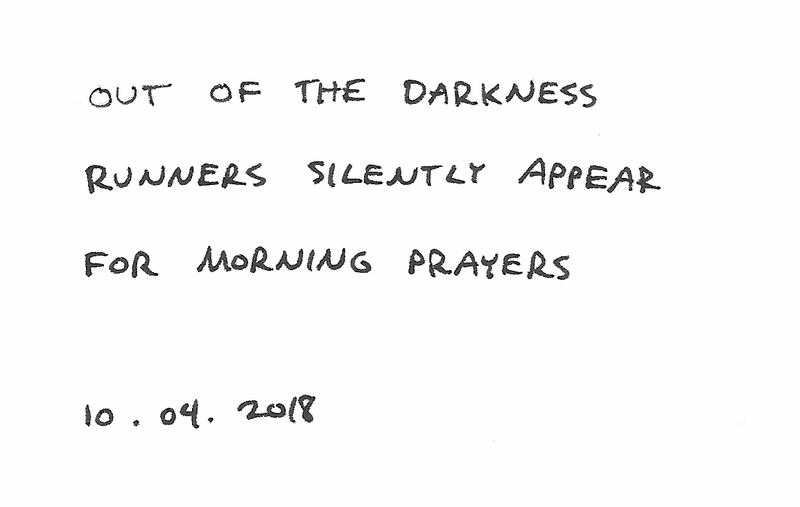 My RunHaiku project has also been an exploration of, in essence, prayer. The act of noticing, listening, connecting. Curiously, in looking into this practice I came across a Navajo poem, which looks a lot like a RunHaiku! No matter how mundane some action might appear, keep at it long enough and it becomes a contemplative, even meditative act. The first time you run, there’s little meditative or prayerful about it (aside from the pleading cries for release from this cruel torture and burning in the lungs! ) But over time, the simple habit takes on meaning and importance that can be difficult to describe. This is why I recommend, if you’re feeling disconnected, distracted, and a bundle of anxieties and cares, go for a run.